Holy Cow! I’m writing this on Thursday in preparation for Friday’s Strange But Good and I just realized that tomorrow is Friday the 13th! Yikes! Not that I’m superstitous…just makes you think. Anyway! I love Strange But Good hostessed by the lovely Laura at Sprint 2 The Table. I don’t participate as often as I’d like, but hey we do what we can. As I’ve said before, teaming up with the other Strange But Gooders makes me feel not so strange. So Here Goes! I’m vegetarian…No news there. My best friend Gail is also vegetarian. She has a close personal relationship with WebMD. Closer than she’d like. She gets so many e-mails from them that if I were her, I’d be afraid they were stalking me. She does find some really good and easy vegetarian recipes sometimes. This one was one of the best and easiest. 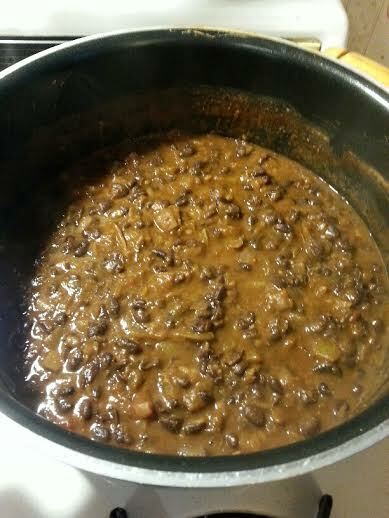 Simply called Black Bean Soup it was so easy that in a hectic day when I planned all day to make it and then had many stumbling blocks, I still made it and it was done in short order. I had no cumin, tried Alice-she didn’t have any, tried Gail-she didn’t have any. Resorted to going to the grocery store. As I’m getting into the car, Ralph calls and says our Christmas cards are ready at the printer and I need to pick him up and we have to drive the 20 minutes to the printer. We do, I come home and this soup sounded so easy I said what the heck, I’ll give it a try. As with many things I seem to show on Strange But Good, it tastes better than it looks. I feel the need to warn you of that. This is not pretty food, but oh so tasty. See…as I said, it’s not pretty. The recipe calls for putting it in the blender, but I’m not a fan of blended soups, I like texture. I have an immersion blender, but I didn’t feel like getting it out and probably ending up covered in soup. I got out my trusty potato masher and mashed away. It worked very well. Smashed things up just enough, thickened the soup. Excellent. But I felt it need to be a little more substantial to hold me for the evening so I quickly cooked up some quinoa. Who can’t use a little added protein? 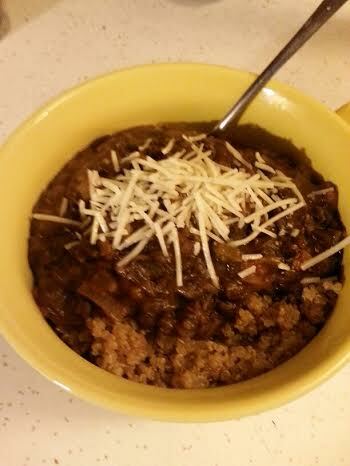 I put the soup over the quinoa and added some of my ever-present Romano cheese. A little cheddar would have been more appropriate, but I work with what I’ve got. Also didn’t add the sour cream or cilantro for the same reason. Again, not pretty but so good. The prep time says 30 minutes but I don’t think it even took that long. You can have most of the ingredients in your pantry ready for when you want to make it. Believe me, I will keep them on hand All The Time. It could also be a good basis for other dishes. I like that in a recipe. Give this a try, it’s worth it! 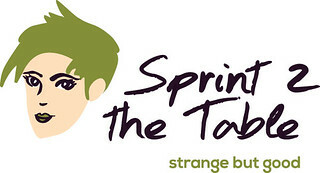 Be sure to check out what the other strange people are sharing over at Sprint 2 The Table. You never know what you’ll find! This entry was posted in Uncategorized and tagged Holiday Hub Bub, recipe, Strange But Good. Bookmark the permalink. Phooey!! I no you’re not a fan of spicy things so I didn’t think you’d have it. Now I have enough to keep me until the end of next year…at least!! I know I told you before… I think brown food tastes the best! 🙂 You know I love the nod to extra protein too. This looks fabulous – I’ll have to try it out! I love you for so many reasons…brown food is one of them!! I liked this so much I made another batch yesterday along with another soup. Tis the season for soup. Have a great day, Laura! You’re too funny!! I made another pot of it yesterday along with another recipe. It’s a great one for us veggies! I hope to post it soon. It’s tasty! Have a great day, Meghan!